Merlot? Merlot, you ask? 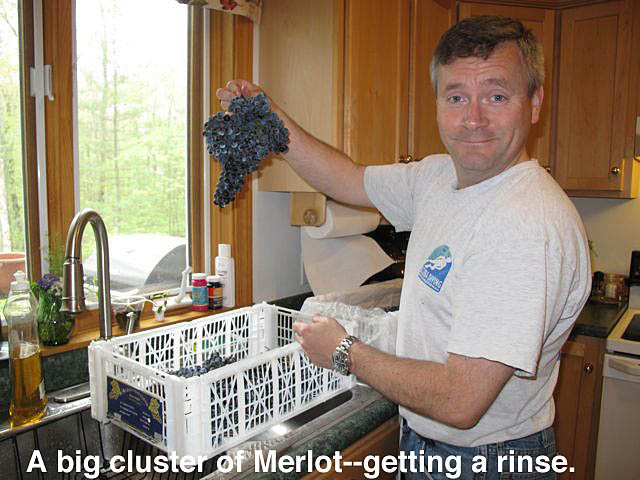 Well, I'm not a huge Merlot fan to be honest. I ordered Chilean pinot noir. But my local winemaking place called and said the Chilean Pinot noir looked really bad this year and M&M wine grape in CT didn't send it to MA because it was so bad and they knew my local retailer would refuse it. So they called and offered me Merlot or Malbec. 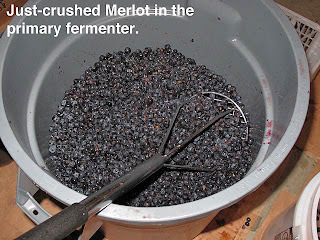 The last batch of Malbec from Chile had some pretty bad numbers to be honest, so I decided to try Merlot, which is a lot easier to ripen. It was a tough year for Chile so I'm looking for something that will actually make decent wine. 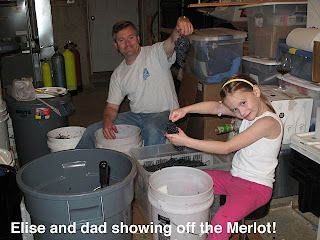 I took delivery of (8) 18 pound lugs of Merlot. They didn't look terrible, but not great either. A few fuzzy grapes with mildew and a few rotted ones here and there, but not as bad as the Malbec as I was told by my local winemaking buddy Steve. I sorted them carefully and also did something I have never tried before: rinsing. In the past I have had issues with Hydrogen Sulfide in my Chilean wines. 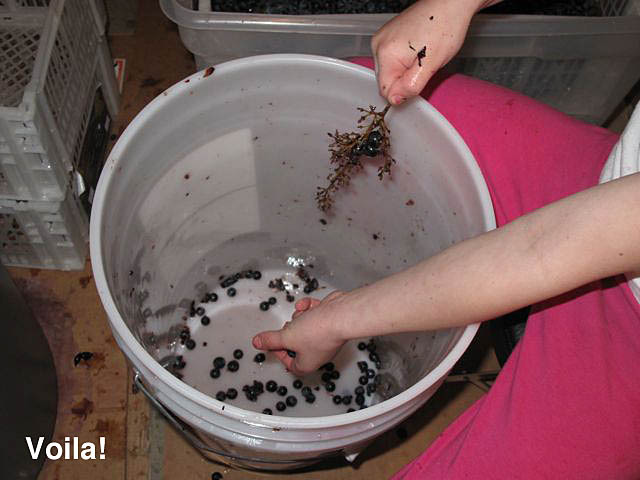 I got a tip to rinse the excess sulfur off the grapes that is added as a preservative for shipping. We'll see if it happens. As I was rinsing and sorting, I pulled out my trust refractometer to measure the brix of a few sample grapes from each lug. It was interesting that it was very consistent within each lug. For example, I tested about 5 grapes in one lug from different bunches and got 25 brix. In the next lug I got very consistent 27 brix. In the next, 24. 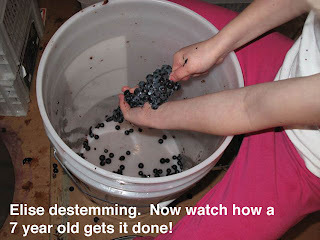 The rinsing probably adds a tad of water to the mix, slightly diluting the must, but with grapes ranging from 24-27, I'll be ok.
Of course, once again I enlisted the kids to be my destemmers (slave labor true, but they enjoy it). 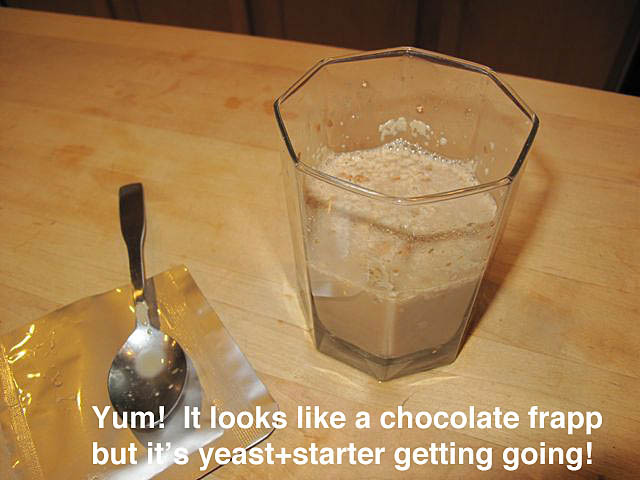 I let the must warm to 60 degrees in the cellar overnight before adding the yeast (RC212 with Go Ferm starter) and now we have a nice ferment going. 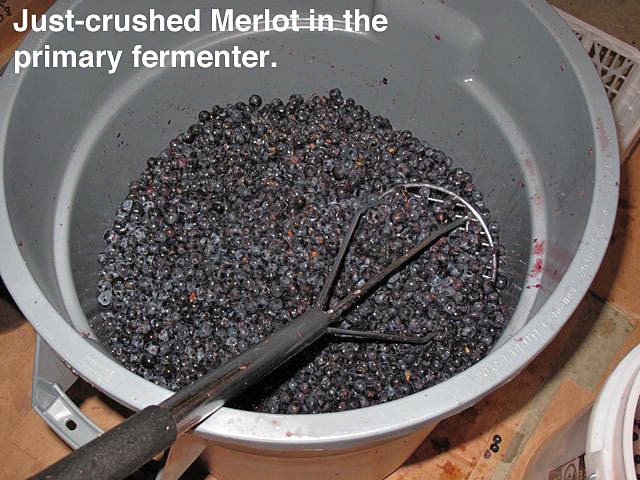 The numbers were about perfect on the Merlot though. Once I had enough juice in the morning to get a hydrometer reading and a sample for the pH meter, I got a Brix of 24.5 and pH of 3.55. Can't really complain about that. Once it hit 65 on it's own I turned on the heat and set it to 75. The cellar smells wonderful and I'm punching the cap three times a day.